Bowmanville Rotarian Chris Zelasko, along with son Nick, presented a cheque for $505 to Debbie and Mel Clench in support of Shayne's Shore Run. Shayne's Shore Run is an annual event started by the Clenches in honour of their late son, Shayne. 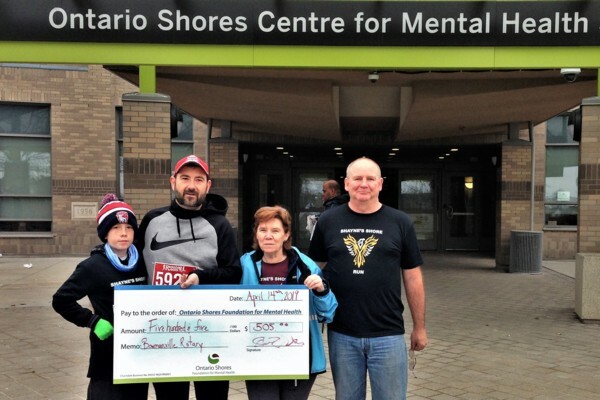 The run raises funds to support the Outpatient Transitional Aged Youth Clinic at The Ontario Shores Centre for Mental Health Sciences in Whitby. In recent years Lakeridge Health has deemed toiletry items as non-essential, which can often leave patients in the hospital without the necessary items for personal hygiene. A group of nurses at Lakeridge Health Bowmanville started to provide these items to their patients at their own cost. 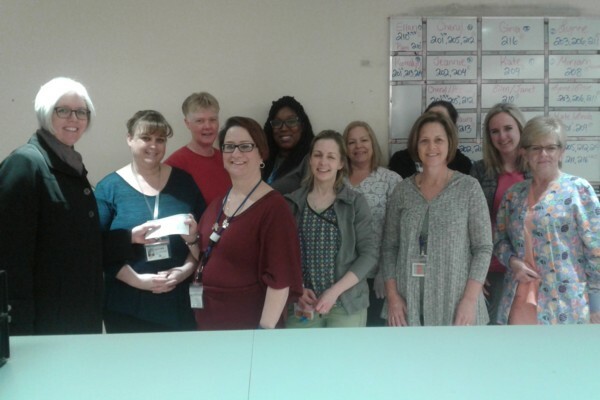 The last 3 years there has been a toiletry drive at St. Joseph's Church to help these nurses provide the simplest of items, for example toothbrushes, toothpaste, shampoo and soap, among other things. The Bowmanville Rotary Club has also helped each year, the first year providing funding to purchase shelves and storage bins for the donations the nurses received, and we continue to help them financially, supplementing the items the nurses need to help take care of their patients. 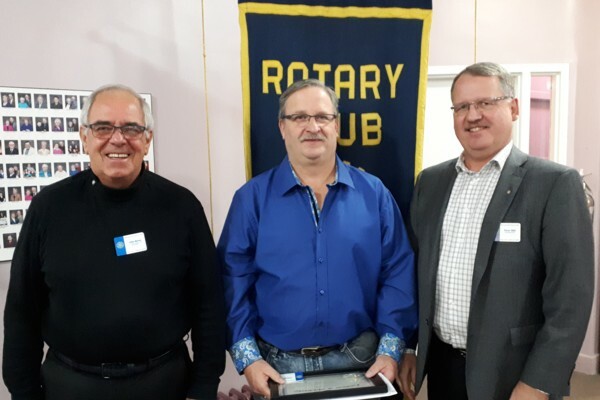 Dave Sullivan joined the Rotary Club of Bowmanville on April 9, 2019. Dave's classification is Promotional Sales. He has been assigned to the New Member Committee and the Fundraising and Special Events Committee. 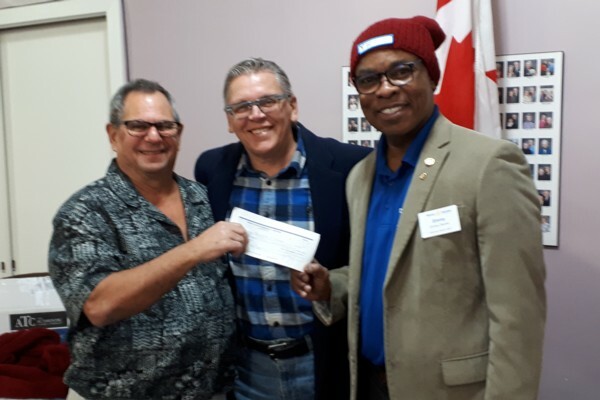 Thanks to the generosity of a Bowmanville Rotarian and his Family, the Rotary Club of Bowmanville was able to donate an additional $1,500 to Feed the Need in Durham. This donation is in addition to the $13,150 donated as the proceeds from the Feed the Need in Durham Concerts that took place last December. Accepting the cheque on behalf of Feed the Need in Durham were Gail Nyberg and Kathie Gayda. Gail originally came from Quebec but spent summers as a child in Bowmanville with her Aunt Vivian and Uncle Howard Pickertt at the West Beach. During her working career she was a school trustee for the Toronto District School Board and eventually became the Chair Person of the TDSB and held that position for many years. She was crucial in the implementation of the school food programs during her tenure. Gail then became the Executive Director of The Daily Bread Food Bank for 13 years and was instrumental in making it the success it is today. She had met Joe Solway will at the TDSB and again worked with Joe on the annual Daily Food Bank fund raisers. Gail moved to Bowmanville 3.5 years ago after her husband told her he wanted out of the rat race in Toronto and for Gail Bowmanville was her only choice. She has three grown sons who all live in Durham Region and are close by. Upon retirement she assisted in creating the Feed the Need in Durham where she currently holds the position of Vice President and this is where Rotarian Eli Brooks first met Gail when they worked on the Rotary's first annual concert for FTND. In February 2018 Gail was awarded the Order of Ontario for her vast charitable works and for the implementation of programs that have aided so many people. Most recently she was co-chair of Mayor John Tory’s communications along with fellow Rotarian Lloyd Rang’s wife. Imagine two Bowmanville ladies running the mayor of Toronto’s communications! We'll learn more about Gail’s exciting life during her Classification talk. That's right Clarington! The Bowmanville Rotary Club's Rockin' Ribs and Brews Festival will be kicking off summer again this year at Clarington Fields on June 7th, 8th, and 9th. So mark your calendars now and make plans to join us for the best ever way to greet summer with a children's stage, midway, unplugged stage, a rockin' stage and, of course, succlent ribs, cold craft beer and much much more. We will also have a shuttle service for your convenience. For more information, please visit our Rockin' Ribs and Brews website and like us on FACEBOOK. The Bowmanville Rotary Club donated $1,000 to support the 2019 Durham ParaSport Games. 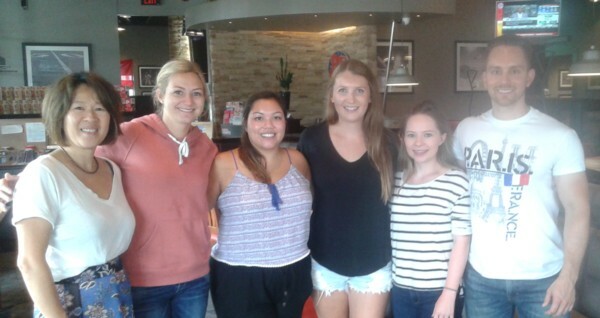 In addition, the Club provided both financial support ($500) and encouragement to Deanna Mcinroy, a local para-athlete. 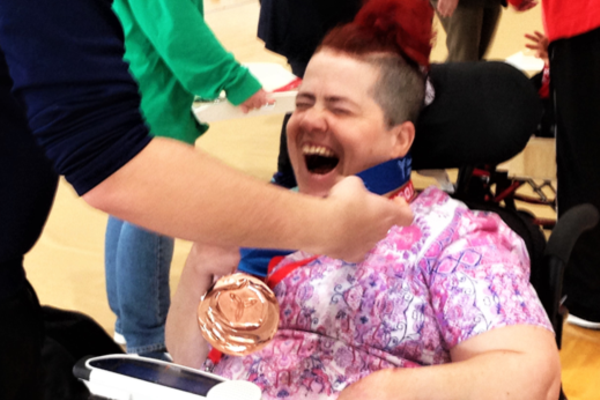 Deanna achieved a Silver Medal in her sport of Boccia. 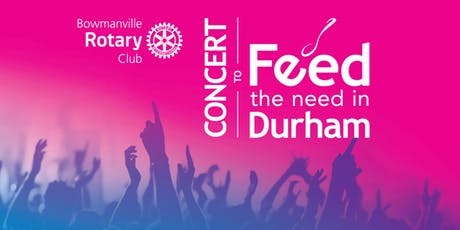 Considering this was the first year for the events, the Concerts for Feed the Need in Durham were a resounding success. 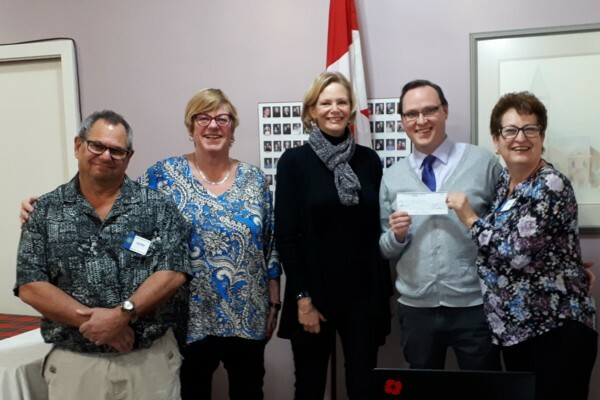 On January 22, 2019 concert organizers Joe Solway and Eli Brooks of the Rotary Club of Bowmanville were pleased to present a cheque for $13,150 to Ben Earle, Gail Nyberg, and Kathie Gayda from Feed the Need in Durham. It is hoped that the concerts can become an annual event to celebrate the beginning of the Christmas season and to help those less fortunate. The Rotary Club would like to extend its sincerest thanks to the many volunteers and musicians who came together to help make Christmas a little brighter for so many. Thank you! Major Roy Snow was born in King’s Point, Newfoundland. He has completed 35 years as an Officer within The Salvation Army. He and his wife (Major Daphne - retired) served as Corps Officers in Newfoundland, Bermuda and Nova Scotia. They have two adult children – Royan (Ali) & Rochelle (Billy). They have one step-granddaughter (Taylor) and one grandson (Liam). For 17 years Major Roy served in downtown Toronto. He has administrative experience in Mental Health & Addictions, Social Services and Long Term Care disciplines. Prior to coming to Bowmanville, he concluded five years as the administrator of the Ottawa Grace Manor. Roy holds a Master of Business Administration degree, a Master of Theological Studies and is a certified LTC administrator. His leisure activities include going to the gym, reading, and watching hockey. Roy will automatically become a member of the New Member Committee and will also join the Community Service Committee. Roy's classification is Clergy. This story has been updated with a revised amount raised! Sponsored by the Rotary Club of Bowmanville, the two December 16, 2018 Concerts to Feed the Need in Durham surpassed all expectations. Thanks to the many local musicians who generously volunteered their time and talent, to the outstanding efforts of many Rotarians, especially Joe Solway and Eli Brooks, to the Bowmanville High School students and staff for their support, and to emcees Carolyn Ellis from KX96 and local councillor Ron Hooper, the concerts raised just shy of $13,150 for Feed the Need in Durham. Given its unique resources and support from companies and other organizations, Feed the Need will be able to purchase up to $92,000 worth of groceries with the funds raised! Here are just a few photos courtesy of Jennifer Foley. For more photos and videos of the concerts, please visit the FACEBOOK page. On November 20, 2018 Erin McLean from Children's Wish Canada visited our Club to tell us about the organization. She shared with us the mission of Children's Wish and related a couple of heart-warming stories about how wishes granted by Children's Wish can make such an incredibly positive difference in the lives of children faced with life threatening diseases and their families. Wishes can be large or they can be small but Erin advised us that the average cost of a wish is about $10,000 because wishes involve the whole family, not just the child. 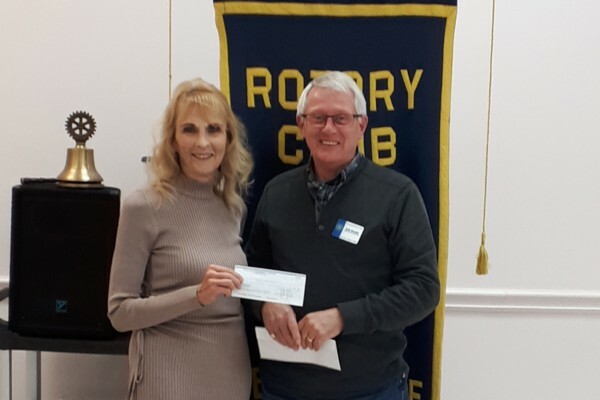 The Rotary Club of Bowmanville was so inspired by Erin's presentation that we invited her back to our December 18, 2018 meeting to present her with a cheque for $10,000 - the average cost of a wish. We would be remiss if we did not acknowledge that the funds for this donation came from a rather significant bequest to our Club by the late Mary Fletcher. Mary had been a long-time supporter of Bowmanville Rotary's initiatives involving children and what better way to acknowledge legacy her than through a donation to Children's Wish. It is with mixed feelings that we must report that we are SOLD OUT of Christmas Trees. Sorry that we do not have any trees left for the last minute shopper but happy that we have raised about $15,000 through our Christmas Tree sales. And you can rest assured that the money will be put to great use right here within our very own community. A sincere "thank you" to all of you who come out to support us every year! A Very Merry Christmas and Happy New Year to One and All!!! 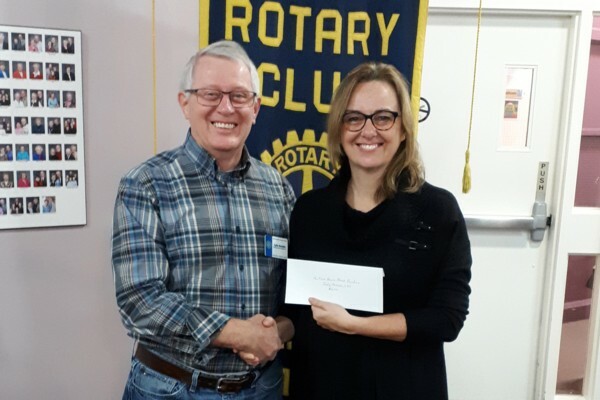 During our December 4, 2018 meeting Rotarian Sandy McLean from IG Wealth Management presented Rotarian Joe Solway with a cheque for $1,050 to help support Rotary's Feed the Need in Durham efforts. The funds will be added to the proceeds from the Feed the Need in Durham concerts that are being held at the Bowmanville High School at 3:00 PM and 7:00 PM on Sunday December 16th. The Rotary Club of Bowmanville would like to extend its sincerest thanks to IG Wealth Management for its generosity in supporting this very worthwhile cause. We would also like to remind everyone to get their tickets for the concerts. 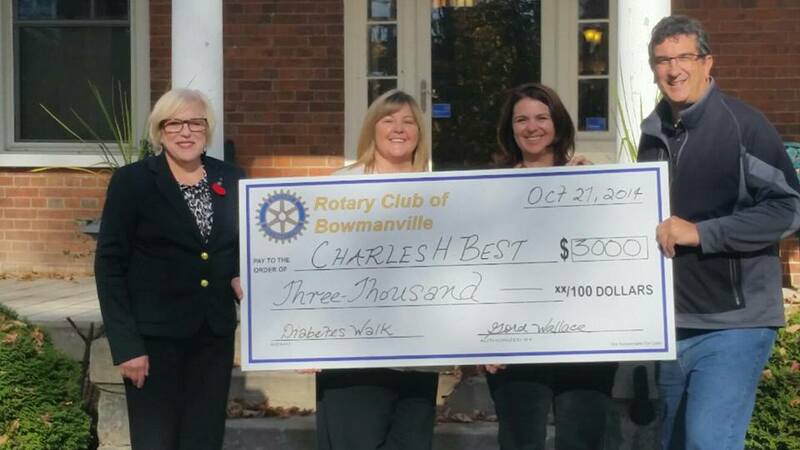 The Rotary Club of Bowmanville was once again delighted to donate $3,000 to support the work of The Charles H. Best Diabetes Centre. Accepting the cheque on behalf of the Centre was Marlene Grass, the founder of the Centre. The Charles H. Best Diabetes Centre provides education and support to over 350 children and 1,200 adults with Type 1 diabetes. Serving Durham Region, it is the first and only centre of its kind in Canada. To learn more about the Charles H. Best Diabetes Centre or to donate to this very worthwhile institution, please click here. Kevin Miller grew up on a dairy farm in Brock Township. After graduating from the University of Guelph and Fleming College in Peterborough he spent thirty years working in Material Management and Distribution. During that time Kevin met and married Brenda, his wife of twenty-six years who was born and raised in Oshawa. Brenda has her own successful wealth management practice with RBC Dominion Securities and her success has allowed Kevin to step away from his career to support her, their family, and our community. Kevin and Brenda have two children. Their son, Taylor, is in his third year of college studying computer programming while daughter Kaitlyn lives in Ottawa where she works and studies Culinary at Algonquin College. Kevin enjoys travelling, camping, craft beer, and a good Leaf game. Welcome to Rotary, Kevin! Autism Home Base Durham is a social club for adults with autism and the people who love them. The charity strives to enrich the lives of adults with autism by offering social and recreational activities within Durham Region. 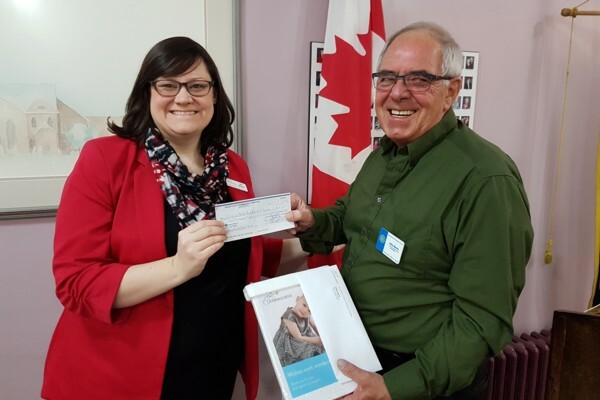 The Bowmanville Rotary Club recognizes the importance and value of such opportunities and was pleased to provide support for Autism Home Base's Clarington Swim and Gym Program with a donation of $2,000 to help offset the costs of facility rental. For further information about Autism Home Base Durham or to support their programs with a donation, please visit their website by following this link. Help us feed our hungry neighbours! Join us for a wonderful afternoon or evening concert featuring a fabulous line-up of award-winning musicians from across the Region all in support of Feed the Need in Durham! Feed the Need in Durham is the only regional distribution hub for emergency food providers in Durham Region. They collect, store, and distribute fresh, frozen, and non-perishable food to sixty-two member agencies. Their members include food banks, soup kitchens, meal programs, in-school nutrition programs, and social service agencies. Ticket Prices? : Tickets for each show are $25 for Adults and $15 for Children 12 and under. Purchase Tickets? 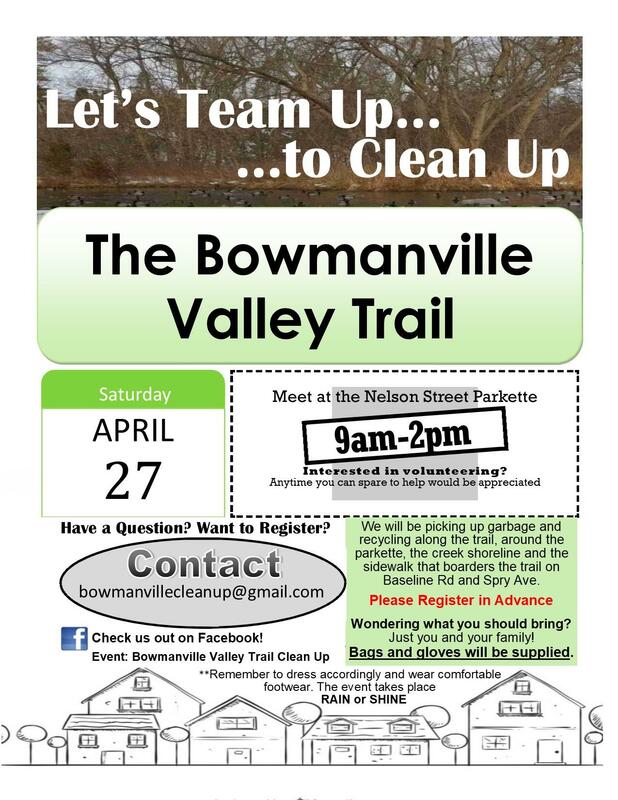 : Tickets may be purchased from members of the Rotary Club of Bowmanville or on-line through Eventbrite by following this link. The Line-up? : Please follow the links for more information about the artists. ** Please note that the programs are subject to change without notice. These amazing concerts are not to be missed! This is your opportunity to treat yourself and your family to some top-notch entertainment and at the same time help those less fortunate in our communities. Show your support and help spread the word! "Like" us on FACEBOOK and share with your friends! We look forward to seeing you. The Rotary Club of Bowmanville recently supported the Lakeridge Health Bowmanville Hospital Foundation with a gift of $10,000. 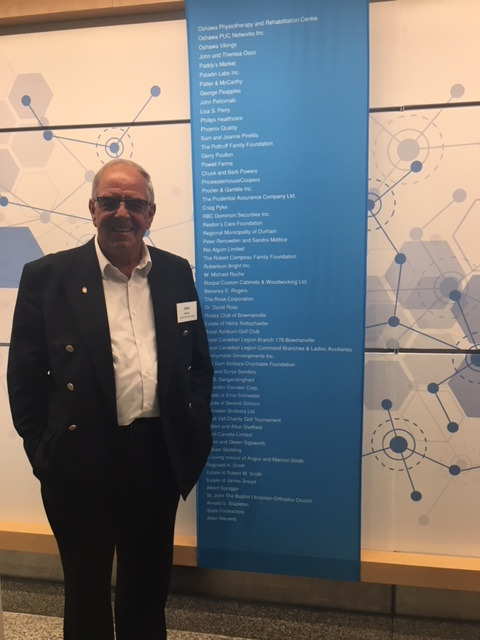 Pictured below is Bowmanville Rotary President John Burns standing alongside the donor's recognition wall at Lakeridge Health Oshawa. 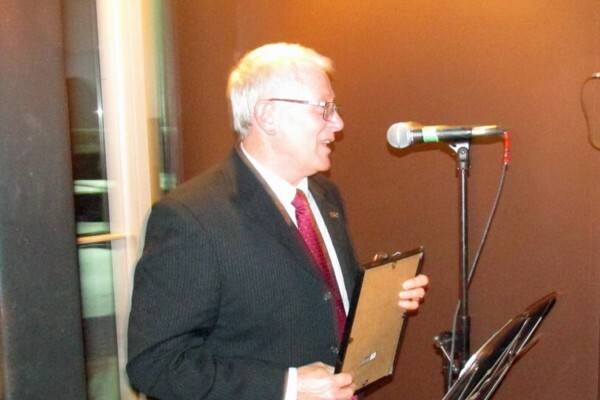 At the Tri-Club Rotary meeting on October 2nd, Bowmanville Rotarian Fred Mandryk was honoured with a Rotary International District 7070 Past District Governors Award for making an outstanding contribution during the 2017/2018 Rotary Year. In presenting the award to Fred, Past District Governor Neil Phillips highlighted Fred's involvement and dedication to the Kids Against Hunger Program that Fred is so committed to. Millions of meals have been packed and distributed to disadvantaged children all over the world including here in Canada. PDG Neil expressed his thanks to Fred for his tireless efforts and hard work in arranging food packaging events with Rotary Clubs all over Ontario. Congratulations Fred; well done!!! The Bowmanville Rotary Club was pleased to be able to help three sisters realize their objective of getting a Rainbow Crosswalk in Bowmanville in support of the LGBTQ community. The three, Jordan McCormack, Alison Ridding, and Emily Allison, originally approached the Municipality of Clarington and received unanimous approval to cost share the creation of the crosswalk. The cost was estimated at about $8,000 which meant that the trio would have to raise $4,000 to see their dream realized. The Bowmanville Rotary Club's New Member Committee, chaired by Joe Solway, started the ball rolling with a donation of $1,000. Following that, Steve Kay, Director of Fundraising and Special Events, offered the three sisters the use of the Club's crowd sourcing site, www.funditclarington.com to assist with their fundraising efforts. The community's response was nothing short of amazing and the remaining $3,000 was raised in less than a week. 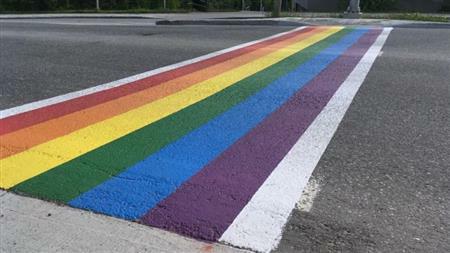 For more information about this unique project, please see the story published in the Clarington This Week or visit the Rainbow Crosswalk Facebook page. Well done everyone!!! Vince Fletcher was a long time member of the Rotary Club of Bowmanville and along with his wife, Mary, they were great supporters of Rotary. Both Mary and Vince were Paul Harris Fellows. Following Vince's passing, Mary continued to support the Bowmanville Rotary Club's Children's Christmas Party with an annual donation of $2,500. Mary Fletcher passed away in April 2018 and is truly missed by those who knew her. The Rotary Club of Bowmanville was surprised and delighted to learn that Mary's will provided for a substantial donation to the Club. During our September 18, 2018 meeting former Club member Don Hutton, a long time friend of Mary's, attended to announce that Mary was leaving the sum of $296,000 to the Club. The Club will take some time to consider how to appropriately disburse the funds. The Finance Committee will entertain suggestions from Club members and all members will be involved in making the decisions. It is anticipated that distribution of the funds will take place over several years as worthwhile projects are identified. During our September 11, 2018 meeting, Rachel Boyd became the newest member of the Rotary Club of Bowmanville. Rachel is the daughter of Rotary member Pauline Calvert. Her classification is "General Insurance" and she will be joining the Youth Service and the New Members Committees. 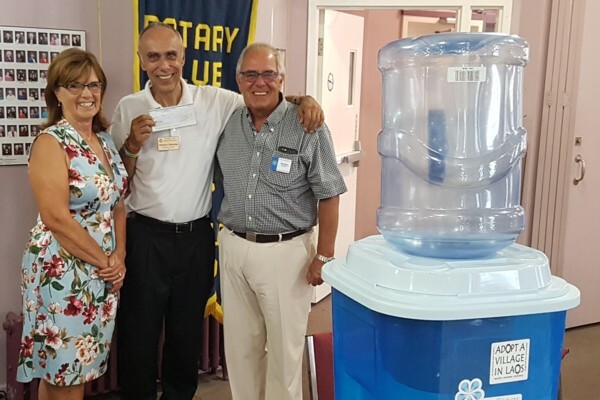 The International Committee of the Rotary Club of Bowmanville was delighted to be able to present Fran Kolesnikowicz with a cheque for $2000 to support the Help Syrian Children Smile Again project. As a result of the civil war in Syria, many children are suffering from PTSD. The project is currently trying to raise €18,200 in order to help 40 children enter a program to assist them in recovering from the trauma they have endured. To learn more about this project or to donate to it, please follow this link. Below is the "Thank You" the International Service Committee received from Help Syrian Children Smile Again. Many many thanks to the Bowmanville Rotary club for your generous donation! مع جزيل الشكر و التقدير لتعاونكم معنا ، أطفال مركزنا و الفريق ممتنين لجهودكم . Layla , Susanne and the Happiness again team. 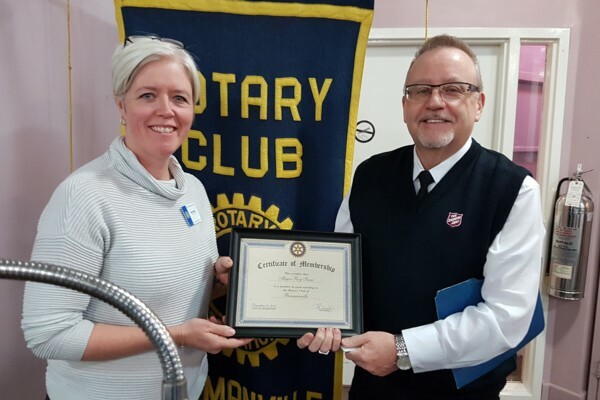 Recently inducted Bowmanville Rotary member Amanda Hoy presented her classification talk during our September 11, 2018 meeting. Amanda is a Barrister and Solicitor with Creighton Law in Oshawa where she practices real estate and wills and estate law. However, her passions are scuba diving, other on-the-edge sports such as parachuting and bungie jumping, and driving her Mustang. Public speaking is not one of her strengths hence the support from Jason Van Stiphout. Amanda is a member of the Community Service Committee and the New Members Committee. Yet Another Successful Summer Respite Care Program! This summer marked the 21st successful running of the Bowmanville Rotary Club's Summer Respite Care Program. The Rotary Summer Respite Care Program is one of the Rotary Club of Bowmanville’s signature programs. The Bowmanville Rotary Club has had a long history of providing support for children with special needs and their families. Recognizing that families with special needs children deserve some respite, especially during the summer months when children are not in school, the Bowmanville Rotary Club offers its Summer Respite Care Program that provides home care for children with special needs. The program began in 1998 with one Respite Care Provider and three families enrolled. Over the past twenty one years it has grown to include between thirty-five to forty children and five Respite Care Providers. The program involves one of the Club’s student Respite Care Providers spending one-on-one quality time with a special needs child and providing educational, social, and recreational activities appropriate for the child. The Care Givers are equipped with a “toy box” of books, toys, games, and other activities designed to help entertain the children. Using funds provided by the Rotary Club, they also participate in outings to Cedar Park, Joey’s Fun World, Municipal Swimming Pools, and other entertainment venues. The Community Service Committee of the Rotary Club of Bowmanville was delighted to present a grant of $1500 to the YWCA Durham to help support women and children escaping domestic violence. Following a presentation to the Club by Debra Mattson, Communications and Fund Development Manager for the YWCA, during which she expressed need for items such as bedding, school supplies for children, and personal hygiene products, the Community Service Committee quickly responded with the donation to help purchase such items. 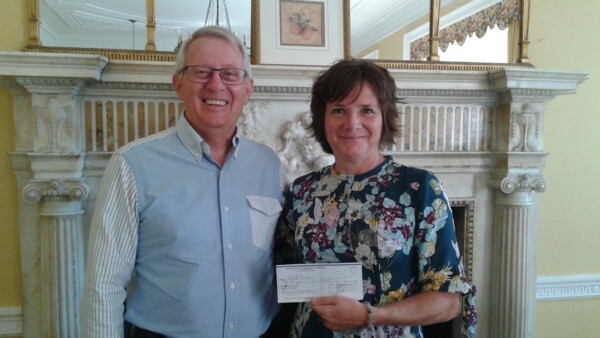 Community Service Director Lyle Goodin was pleased to be able to personally present the cheque to Debra. Soccer is an increasingly popular sport in Clarington and the municipality provides several soccer fields for this purpose throughout the community. The Darlington Soccer Club works hard to keep the fields in pristine condition to enhance player safety and improve game pace and quality. To accomplish this, the Soccer Club owns and maintains a tractor, field rollers, and other equipment used to seed, fertilize, water, and roll the fields. 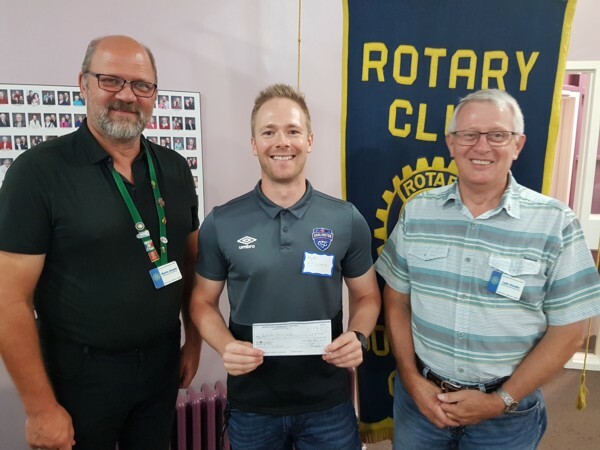 In July the Darlington Soccer Club approached the Rotary Club of Bowmanville, which hosts its Ribs & Brews event at the Clarington Fields, with a request to donate funds to purchase a shed in which to house their equipment. The Soccer Club also offered to engage in a joint branding opportunity. The Rotary Club of Bowmanville was pleased to support the Darlington Soccer Club with a grant of $4400.00 to purchase the much needed shed and offered to pay for a joint branding banner to be affixed to the shed. Steve Rutledge, a Rotarian from the Whitby Sunrise Club, has for several years been working to bring clean potable water to remote villages in Laos. Along with Canadian volunteers and local residents, Steve arranges for the purchase and delivery of water purification units for individual families. The units are constructed in Laos creating a local industry. In addition, he organizes and supervises, along with local engineers and villagers, the construction of small water cleaning damns and pipelines to bring water to the villages. Some pipelines that have been constructed are over five kilometers long. The Rotary Club of Bowmanville is proud to be one of Steve's major sponsors and sincerely appreciate his dedication to Rotary's moto of "Service Above Self". This year our International Committee was once again pleased to provide Steve with a cheque in the amount of $10,000 to support this amazing project. One of the six Areas of Focus of Rotary is Basic Education and Literacy. This focus applies as much to our own students as it does to children in underdeveloped countries. To this end, each year the Rotary Club of Bowmanville donates five bursaries to deserving graduating high school students who are going on to further their education at college or university. Each bursary is valued at $2,000. Students are selected based upon a set of criteria which includes financial need, academic standing, community involvement, and school involvement. This year's recipients were (L to R) Tanner Foster, Breann Saulnier, Mandy Mongeon, Paige Brunelle, and Josh Touw. Also pictured is Rotarian Brad Phillips, Director of Youth Service. On Monday June 25, 2018 the Rotary Club of Bowmanville held a very unique and extra special meeting. The occasion was held in conjunction with the 2018 Rotary International Convention being held in Toronto. Rotary tradition has Rotarians from the hosting nation plan local events for attendees from other countries. 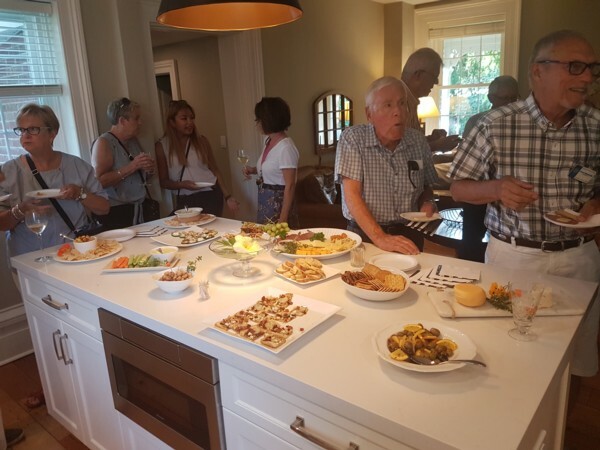 The Rotary Club of Bowmanville was delighted to host about fifty fellow Rotarians from Finland, Ghana, The Kingdom of Bahrain, the United States, and other far-flung and exotic locations such as Calgary and Halifax. The attendees travelled to Oshawa by GO Train (we only lost one who exited at Pickering but was recaptured when he caught the next train) and thence by motor coach to Rotarian Jason Van Stiphout's home for the festivities. Our very own Bob and Doug Mackenzie welcomed the visitors in true Canadian style and performed an induction ceremony to make our guests honourary Canadians. This required them to sing our national anthem, drink Molson Canadian and kiss an NHL puck all while wearing a toque. At its May 1, 2018 meeting the Youth Service Committee of the Rotary Club of Bowmanville donated $3,000 to the Clarington Centre for Individual Studies (CCIS) to be used for bursaries in support of deserving students. The CCIS is an alternative high school within the Kawartha Pine Ridge District School Board. Their goal is to help students graduate high school and achieve a successful transition to college or work. 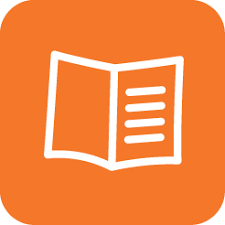 For additional information about CCIS, please visit the website by following this link. Director of Youth Services Brad Phillips presents CCIS Vice Principal Dianne McGregor with a cheque for $3,000 for student bursaries. In 2013 the Rotary Club of Bowmanville received an appeal for funding to help with tuition costs for a deserving foreign student. Her name was Esther Okode and she was the youngest of a family of ten hoping to attend The Technical University of Kenya to pursue a five year degree in Civil Engineering. We were told she was a bright diligent student but did not have the money for a university education. The members of the International Committee of Bowmanville Rotary Club decided to support Esther to obtain her degree. The road for Esther has not been easy mainly due to the ever changing political climate in Africa but she worked hard and at every opportunity tutored and taught to raise what money she could to put towards her education. Today, Esther is a few months away from having her degree in Civil Engineering conferred. It has been an honour to have been part of her journey every year since we first learned of her. There was an air of anticipation and excitement. Ideas were flying, some where dismissed some enthusiastically received but all stimulated conversation and future planning. The shadow board, such an ominous nom de plume, where having their first meeting. Joan Anyan passed away at Lakeridge Health Bowmanville on April 5, 2018. 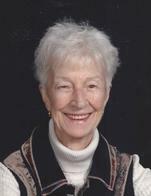 Joan was a former elementary school teacher-librarian and was very active in both her church and community. 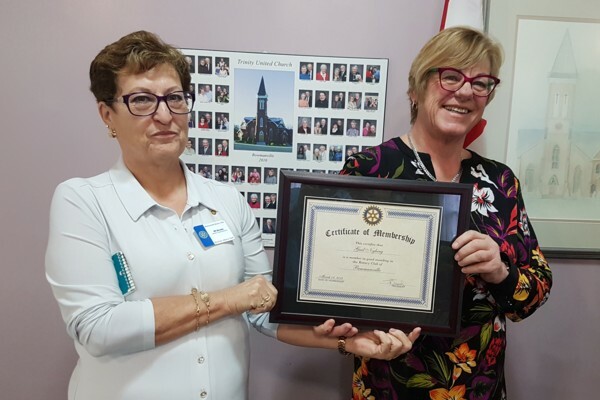 During her funeral on April 11, 2018, the Rotary Club of Bowmanville was privileged to honour Joan's memory by posthumously bestowing upon her a Paul Harris Fellowship. The Fellowship was accepted by her son, Kevin, a member of the Rotary Club of Bowmanville. Joan will be fondly remembered and dearly missed by her family, friends, and community. Pamela Deveaux, Director of Resource Development for Boys and Girls Club of Durham, was the guest speaker at our March 13, 2018 meeting. Ms. Deveaux outlined the mission of Boys and Girls Club of Durham and illustrated its impact on the lives of several of its members. The Rotary Club of Bowmanville was pleased to present Ms. Deveaux with a cheque for $2500 to help further the work of this amazing organization. the impact of the refurbishment of the Darlington NGS on the region. After answering a number of questions, Mayor Foster was thanked by president Reg Freethy. 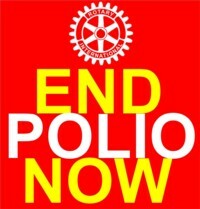 Rotary has been involved in the fight to eradicate polio since 1987. The Insight Section of the Saturday February 17, 2018 issue of the Toronto Star featured an article on this global effort. You may read the article by following this link. The February 6, 2018 meeting of the Rotary Club of Bowmanville was rather special because three of our members were each awarded a Paul Harris Sapphire Fellowship. Our first recipient was Don Hutton who was presented with his first Paul Harris Sapphire Fellowship by Rotary Foundation chair Gord Wallace. The Rotary Club of Bowmanville was honoured to support The Grandview Children's Foundation with a generous gift of $20,000. Present from Grandview to accept the donation were Foundation Board Chair Bryan Yetman, Executive Director of Development Brigitte Tschinkel, and Grandview Centre Trustee Brad Phillips. Presenting on behalf of the Rotary Club of Bowmanville were President Reg Freethy and President-Elect John Burns. Prior to the presentation, Bryan Yetman and Brigitte Tschinkel showed a short video which spotlighted the amazing achievements of one young lady who was a "Grandview Kid". They emphasised the wonderful work Grandview does on behalf of children with special needs and with 3000 children on a wait list, the need to grow and expand the services offered by Grandview. For more information about Grandview Children's Centre or to donate, please visit their website by clicking here. On Tuesday January 30, 2018 the Rotary Club of Bowmanville held a special evening meeting to celebrate the life and works of Scottish poet Rabbie Burns. The evening began with an opportunity to sample the various brews offered by Brock Street Breweries and, in keeping with the theme of the evening, an opportunity to nose, sip, and evaluate the flavours of three exceptionally fine single malt whiskies. Adding to the experience was the knowledgeable commentary offered by John Burns and Gord Wallace. The Bowmanville Rotary Club's annual Christmas dinner, held at the Clarington Beech Centre on December 12, 2017, was special in several ways. First, it was an opportunity for Rotarians and their partners to get together for an evening of good food and fellowship. And, it was also the perfect opportunity to make two very special presentations. The first, a Sapphire Paul Harris Fellowship; the second, a major donation by the International Committee to Allison Edwards' Jinja Connection. The Annual Rotary Children's Christmas Party was once again a great success with about 140 children, parents, grandparents, friends and Rotarians in attendance at the Clarington Beech Centre on Sunday December 3, 2017. Everyone was delighted with the craft table, decorating gingerbread men and women, face painting, and balloon art. But of special interest was the presence of Soper Creek Wildlife Rescue who set up a display for the children and brought five unique animals for the children to learn about and pet. Rotary International is the world's first service club organization with more than 1.2 million members in over 34,000 clubs worldwide. Rotary club members are volunteers who work locally, nationally, and internationally to combat hunger, improve health and sanitation, provide education and job training, promote peace, and eradicate polio under the motto "Service Above Self". We are proud to be a part of this dynamic organization as we celebrate 94 years of service in our community. Please take a few minutes to peruse our website and read our promotional brochure, "This is The Rotary Club of Bowmanville". Are you the missing piece? Are you interested in joining Rotary? 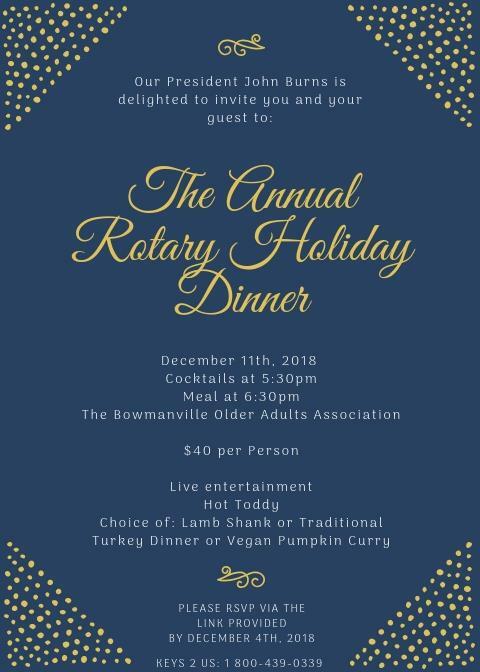 For more information about Rotary and the Rotary Club of Bowmanville, please contact Amy Barney at 905-697-8251 or email amykbarney0407@gmail.com. Thank you. The Rotary Christmas Trees have arrived at Watson Farms Market. We have a great selection of spruce and firs ranging in price from $40 to $70 (HST included) depending on size and variety. The proceeds from the sales of Rotary Christmas Trees help fund our charitable initiatives in our community. This means that you can select the perfect tree and help your community by purchasing a Rotary Christmas Tree. It doesn't get any better than that. Bowmanville Rotary Donates a "Buddy Bench"
October 10, 2017 saw the official dedication of a "Buddy Bench" at John M. James Public School. The "Buddy Bench" was donated by The Rotary Club of Bowmanville. The purpose of the bench and details of the dedication ceremony were well covered in a story published in The Clarington This Week. Rotary District 7070 Governor Neil Phillips spoke at a special Tri-Club meeting held Tuesday October3, 2017 at the Oshawa Golf and Country Club. Rotarians from the Oshawa Rotary Club, Oshawa Parkwood Rotary Club, the Bowmanville Rotary Club, and a number of guests were present. D.G. Neil began by stating that he had not come armed with a laundry list of "to dos". His philosophy is that most ideas for moving Rotary's objectives forward come from the grassroots and that District 7070 and Rotary International are there to support those initiatives. 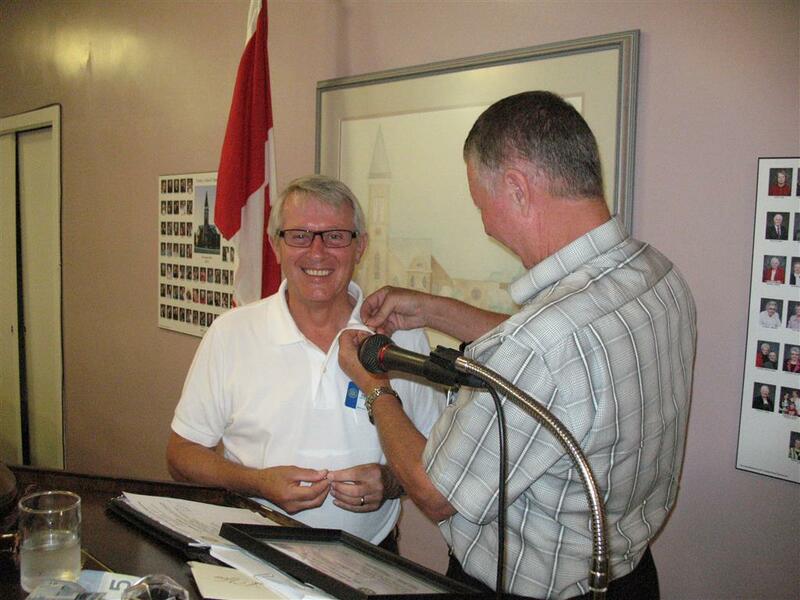 At a special Tri-Club Rotary meeting held on Tuesday October 3, 2017 at the Oshawa Golf and Country Club, Bowmanville Rotarian Chuck Cattran received a Paul Harris Fellowship Sapphire Pin to recognize his contributions to the Rotary International Foundation. 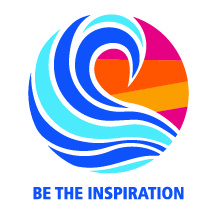 The mission of The Rotary Foundation is to support the efforts of Rotary International in the fulfillment of the Object of Rotary, Rotary International’s mission, and the achievement of world understanding and peace through local, national, and international humanitarian, educational and cultural programs. Congratulations, Chuck, and thank you for your dedication to and support of the Foundation. Rotary District 7070 held its annual Rotary Foundation Walk on Sunday September 10, 2017. The 5.1 km walk was hosted by the Whitby Rotary Clubs and was held at the Heydenshore Pavilion. The route travelled through park land, past the Whitby marina, and around the block enclosing the park where the Whitby Sunrise club holds its annual Ribfest. Bowmanville was especially well represented this year. President Reg Freethy, nine club members, and one member's spouse participated. Breakfast consisted of fruit, granola bars, and assorted drinks. Following the walk, lunch included a pulled pork sandwich with salad and chips. All-in-all, a great way to spend a beautiful Sunday morning and raise ~$120,000 for Rotary Foundation. 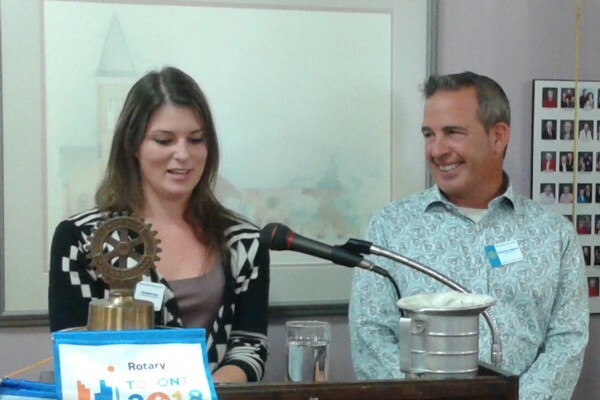 The Summer Respite Care Program is one of the Rotary Club of Bowmanville’s signature programs. The Bowmanville Rotary Club has had a long history of support for children with special needs and their families. Recognizing that families with special needs children deserve some respite, especially during the summer months when children are not in school, the Bowmanville Rotary Club offers a Summer Respite Care Program that provides home care for children with special needs. At its August 8th meeting the Rotary Club of Bowmanville continued its generous support of Steve Rutledge and his Adopt-a-Village-in-Laos project with a donation of $10,000. Steve's dedication to this project is truly inspiring and the success of the project is evident in the increase in health and wellbeing of the villages he has supported to date. For further information about Adopt-a-Village-in-Laos or to donate to this amazing project, please visit the website by clicking here. The annual Rotary Adventure in Citizenship Program has been a signature program of the Rotary Club of Ottawa since 1951. Approximately 220 senior high school students from across Canada spend four days in Ottawa experiencing tours, lectures, discussions and social events designed to enhance their understanding and appreciation of Canadian citizenship. This year the Rotary Club of Bowmanville was pleased to sponsor Bailey Elliott, who has just graduated from Clarke High School, to attend the program. At the Club's meeting on July 18, 2017, Bailey was our guest speaker. She spoke about her experiences with the program, the insights into our democratic institutions that the program provided her, and how it inspired her. Bailey, who is also one of our bursary winners, will be attending Carleton University in Ottawa this fall where she is enrolled in the Global Law and Social Justice program. 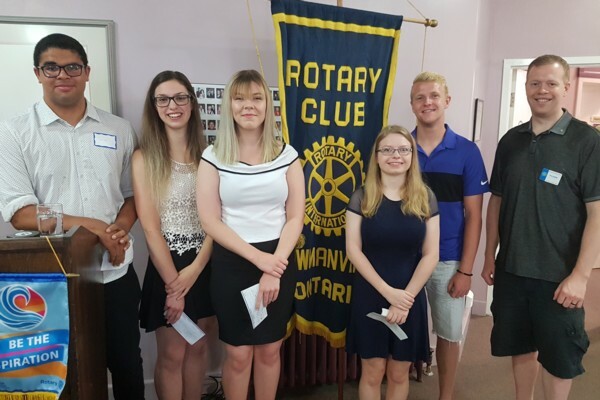 At its July 11th, 2017 meeting the Rotary Club of Bowmanville was pleased to present bursaries to eight accomplished and deserving Clarington students who were either continuing their post secondary studies or were entering their first year of post secondary education. The District 7070 District Assembly held at the BMO Institute for Learning, 3550 Pharmacy Avenue, Scarborough ON M1W 3Z3 from 8:00 AM to 2:00 PM on Saturday May 13, 2017 was an excellent opportunity to learn more about Rotary. Workshop sessions included dealing with conflict, vibrant clubs (a workshop from PETS that was back by popular demand), your public image, membership, youth exchange, and an excellent session on Club governance. Also, two sessions on grants - one each with a focus on district or global grants. Each of these constituted a make-up for Clubs that missed the Grant Management Certification seminar held in Oshawa in April. All in all a very worthwhile way to spend a rainy Saturday and one of the best attended District 7070 Assemblies ever. Our 10th Annual Ribs & Brews Event was one of our best ever and it is all thanks to you, the families in Clarington who came out on the June 9th to 11th weekend to have a good time and at the same time support Rotary. The new venue at Clarington Fields gave us lots of room for the music, craft brewers, ribbers, fun foods, vendors, carnival and so much more. The new Kids Zone, sponsored by OPG, was a success and we look forward to making it even better. The great news is that we raised about $127,950! This money will be used to support our charitable work within Clarington and throughout Canada and the rest of the world. If you have comments or suggestions about the event or would simply like to keep up-to-date with what we are up to, why not like us on FACEBOOK. The Matawa First Nations Learning Centre in Thunder Bay held its graduation ceremony on June 8, 2017. The Rotary Club of Bowmanville is pleased to be able to support the Learning Centre by providing $11,000 in bursaries to recognize the achievements of graduates or classrooms. Two Bowmanville Rotarians, Ted Mann and Georg Krohn, attended the ceremony. As a token of their appreciation, the Matawa Learning Centre presented the Club with a framed Rotary logo intricately created in bead work. For more information, please download the ceremony program by clicking here. Much "I Do" About Nothing, with apologies to the Bard, was a unique fundraising event planned by The Rotary Club of Bowmanville. About 48 Rotarians and guests gathered in the beautiful Newcastle Town Hall to witness an "interesting" wedding ceremony for which members of the wedding party were chosen from a bucket (another addition to someone's bucket list?). The festivities, complete with a Scottish emcee, a drunken mother of the bride, a short man with a big gun, and a truly vivacious maid of honour, provided lots of laughs and raised ~$3500 for the Rotary Club's Respite Care Program. The ceremony was followed with a sumptuous dinner catered by KCC Gourmet Catering and dancing to the music of a disc jockey. Although the marriage will not likely last (the bride and groom each left with someone else), the memories of a great time surely will. All About Purple! That was the theme for Epilepsy Durham Region's Annual Purple Pancake Breakfast held at the Bowmanville Older Adult Centre, 26 Beech Avenue, Bowmanville on Tuesday February 21, 2017. A hearty breakfast of pancakes and sausages topped with butter, blueberries, and maple syrup was served by members of he Bowmanville Rotary Club between 07:30 AM and 09:00 AM to many hungry guests. The cost was by donation and a little over $500 was raised to support Epilepsy Durham Region. Our sincere thanks to those who came out to support this great cause. The annual Lions/Rotary Elimination Draw was held at the Bowmanville Older Adult Centre on Wednesday February 15, 2017. Attitude adjustment and side betting began at 6:00 PM with a roast beef dinner catered by Hampton United Church served buffet style at 7:00 PM. After dinner the eliminations began with number after number falling by the wayside until only three remained. Third last out was Heather Griffin who won $200. Second last out was Tom Wright who won $300. And the last number to be eliminated belonged to Mike White who won the Grand Prize of $2000! Congratulations to the winners! Names are eliminated as the numbers are drawn. When a bunch of Rotarians and friends gathered at Shooters Billiards in Bowmanville for an evening of fellowship and a few games of pool, they knew they were in trouble when Don The Hustler Hutton showed up with his own custom pool cue. The handful of sharks in the room and the Fast Eddie Felson wannabees all had a great time chatting, joking, and knocking the balls about. The evening ended with one thing being very clear; some rematches are in order! Fred Devries takes a bead on the 8-ball while Paul Davidson (L) and Brad Phillips hope for a miss. Dianne McGregor, a Vice Principal at the Clarington Campus of the Centre for Individual Studies (CIS), spoke to the Rotary Club of Bowmanville about the program on Tuesday December 20, 2016. The CIS is an initiative of the Kawartha Pine Ridge District School Board. Its purpose is to provide "a dynamic educational experience in a flexible environment where students and staff together pursue their quest for life-long learning in an atmosphere of cooperation, dignity and mutual respect". 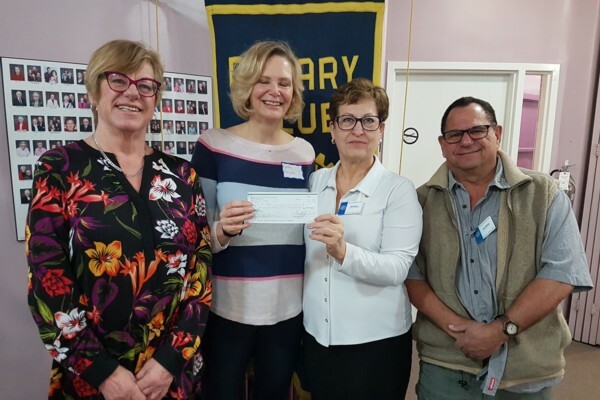 Following her presentation Dianne accepted a donation of $2000 from Chris Christodoulou, Director of Rotary's Youth Service Committee, to help support this very worthwhile program. The Rotary Christmas Tree sales were once again a great success!!! The Rotary Club of Bowmanville wishes to express a heart-felt "Thank You" to everyone who supported us by purchasing a Christmas Tree. Be assured that the profits from your purchase of a tree will be put to good use as we continue our charitable work both within our community and around the world. During its annual Christmas Dinner held at Tetra Kitchen and Vines, the Rotary Club of Bowmanville honoured two of its own members by bestowing Paul Harris Fellowships on them. The recipients of the honour were Renee Bos and Lyle Goodin. Renee has been a member of the Club since November 2005 while Lyle joined in May 2007. 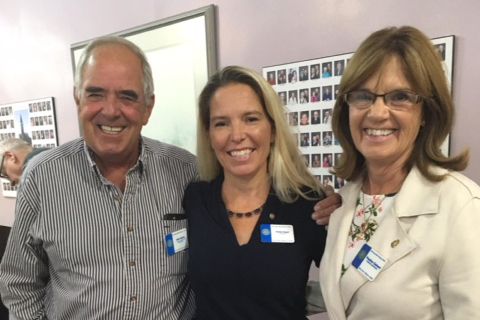 Both Renee and Lyle were cited for their voluntary contributions to both Rotary and their community. Congratulations to Bowmanville Rotary's newest Paul Harris Fellows. Long time Bowmanville Rotarian John (Jack, JJ) Risk was honoured with a Paul Harris Fellowship at our December 6, 2016 meeting. 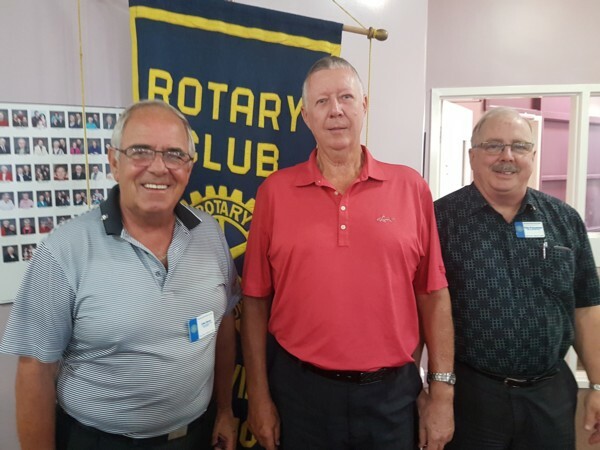 John was introduced by his long time friend and fellow Rotarian Don Welsh who, with a little humour, outlined John's life story and his significant contributions to his community and to Rotary. John thanked the club for the honour and was given a standing ovation. The Annual Rotary Children's Christmas Party was once again a wonderful success. About 160 children, parents, grandparents and Rotarians gathered at the Clarington Beech Centre on Sunday December 4th for a whole lot of fun. There was music, face painting by the very talented Janet Lange, entertainment provided by Magical Duda, and, of course, a visit from Santa himself who gave gifts to all the children. Thank you, Santa! And what is a party without food? The afternoon began with pizza and hot dogs and rounded out with a delicious turkey dinner prepared by King's Court Gourmet Catering. As a special treat for the children, the Rotary Respite Care Givers were present to share some time with the children. Special thanks are due to 7070 District Governor Jim Louttit for attending, to our elfish Respite Care Givers for being there for the children and for assisting Santa with the distribution of gifts, to Van Belle Floral Shoppes for donating the beautiful poinsettias, and to the Rotary Rookie Committee, chaired by Paul Davidson, who so capably organized the event. Thanks also to Mike Weatherbee for acting as emcee and to all the Rotarians who gave of their time to make the event a success. For photos of the event, please visit our Photo Albums located on our Home Page or follow this link. The Bowmanville Rotary Club is going to Winterlude in Ottawa to celebrate Canada's 150th Birthday and, in true Rotary fashion, to have some fun. Tickets are $199 per person and are available from Kevin Anyan. For full details, check the Event Information posted on this website by following this link. The Rotary Club of Bowmanville was pleased to provide financial support to Bethesda House at its November 22, 2016 meeting. Since its founding in 1992 Bethesda House has evolved from a simple shelter for abused women and their children into a comprehensive system of support services for victims of domestic abuse. The donations were accepted by Jaki MacKinnon, Executive Director of Bethesda House. A donation of $3200 from the Community Service Committee for repairs to the eaves troughs was presented by Director Tim Funchion and a donation of just over $1000 from the Rookie Committee for the purchase of a new freezer was presented by Chair Paul Davidson. The Rotary Club of Bowmanville welcomed Amy Barney as our newest member on October 18, 2016. 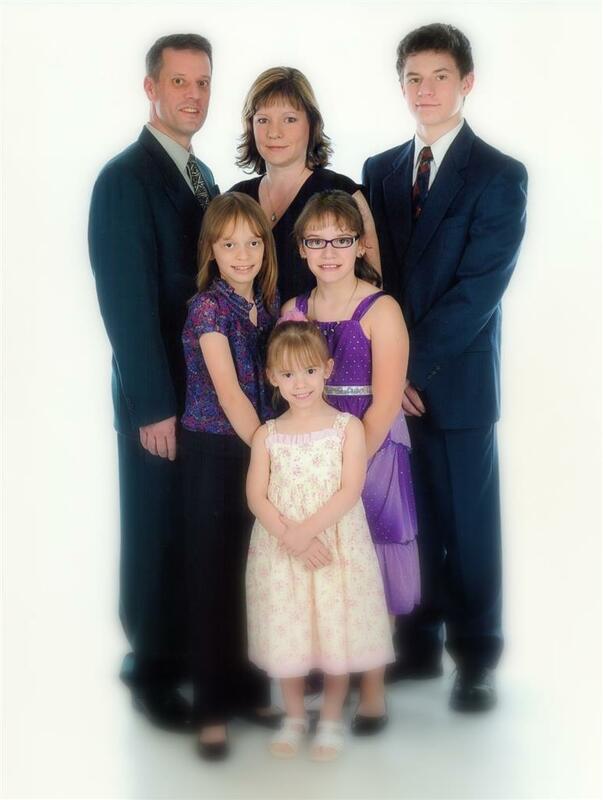 Amy's classification is Funeral Director and she is associated with Northcutt Elliott Funeral Home in Bowmanville. Amy will join the Community Service Committee and the Rookie Committee. President David Penney (L) and sponsor Denis Beaulieu (R) induct Amy Barney as a member of The Rotary Club of Bowmanville. Allison Edwards is one amazing young woman and the Rotary Club of Bowmanville is proud to once again support The Jinja Connection. Founded by Allison in 2012, The Jinja Connection's goal is to provide an opportunity for street children in Jinja Uganda to receive at least a primary education. Allison's mission is to help these children improve their lives and, hopefully, give them the opportunities every child deserves. For more information about The Jinja Connection, please visit the website at http://ugandastreetkids.org/jinja-connection/. The Rotary Club of Bowmanville is pleased to welcome Angelique Ball and Junior Afana as our newest members of the club. Angelique (Angie) was sponsored by Steve Kay. She will be joining the Fundraising & Special Events Committee and the Rookie Committee. Her classification is Logistics Manager. Junior was sponsored by Jim Abernethy. He will be joining the Membership Committee and the Rookie Committee. His classification is Auto Recycling. A very warm Rotary "WELCOME" to both Angie and Junior. The very successful 2016 Rotary Foundation Walk was hosted by the Rotary Club of Brighton. Over 330 Rotarians, family, friends, and pets participated in the walk. The Rotary Club of Bowmanville contributed in excess of $5,000 toward the over $120,000 that was raised for the foundation. Seven Bowmanville Rotarians and one family member represented our club. The walk through the town of Brighton presented a delightful mix of old and new architecture with interest added by participation in a quiz to be filled out during the walk. All in all a great day! The Rotary Club of Bowmanville has been running its very successful Summer Respite Care Program for about 25 years. This past summer represented the biggest program yet with 39 children from 36 families being cared for by our five Respite Care Givers. The Club would like to extend a heart-felt thank you to the families and to the Care Givers for making this program such a tremendous success. 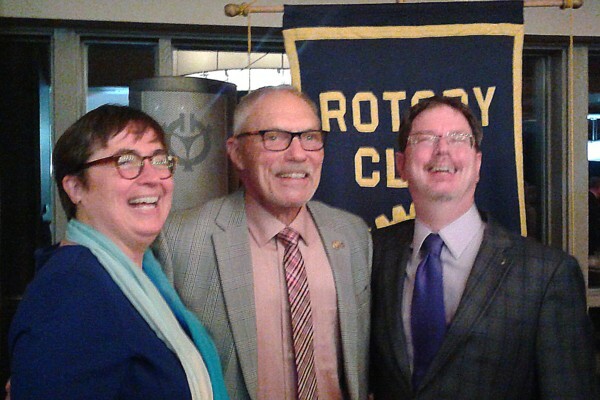 The Rotary Club of Bowmanville was honoured to host District Governor Jim Louttit and Assistant District Governor Beth Selby at its August 30, 2016 meeting. DG Louttit outlined his vision for his year as District Governor and shared his message of leadership, exchange of ideas, and taking action. Picasso's Picnic is an arts and cultural event for kids and by kids. The picnic was the brainchild of Koren Kassier and a small group of parents. This idea was to develop an arts and culture event with an entrepreneurial aspect to it. Picasso's Picnic is the result of that idea. The Rotary Club of Bowmanville was pleased to have Koren as its guest speaker on Tuesday August 16, 2016 and to provide support in the amount of $1,500. Picasso's Picnic takes place on Saturday August 20, 2016 at the Visual Arts Centre of Clarington. For details about the event, please visit their FACEBOOK page. Steve Rutledge is an amazing guy and a consummate Rotarian! For years now Steve has been involved in a program he developed that is designed to bring potable water and sanitation to remote villages in Laos. Steve funds the program through donations and in all likelihood from his own pocket. The Rotary Club of Bowmanville has been privileged to support Steve in his endeavours for several years now and we are thrilled to announce that we will once again be donating $10,000 to the Adopt-a-Village-in-Laos project. Steve was our guest speaker on August 2, 2016 during which he shared a review of his latest projects with the club. We wish to thank Steve Rutledge for all he does and for being an example to us all. On July 26, 2016 the Rotary Club of Bowmanville was delighted to induct Janet Lange as its newest member. Janet is the owner of Janet Lange Art and Design in Bowmanville. Janet's classification is Art and Design. She will be joining the Community Service Committee and the Rookie Committee. 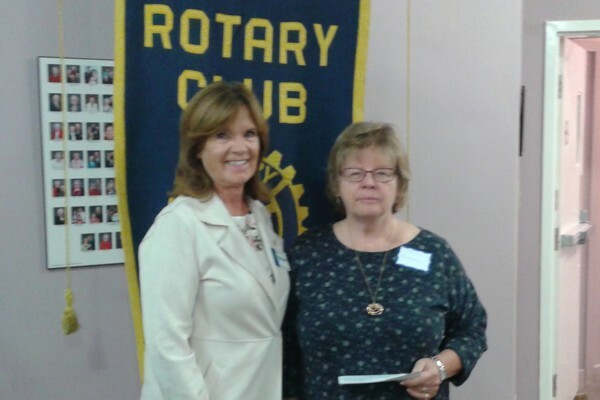 Welcome to the Rotary Club of Bowmanville, Janet. 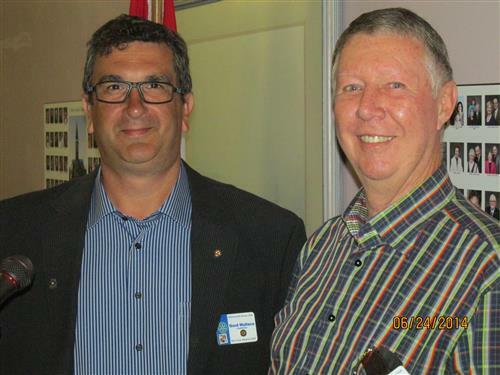 The June 28, 2016 meeting of the Rotary Club of Bowmanville marked the annual changing of the guard as President Steve Code became Past-President and President-Elect David Penney became the Club's president for the 2016-2017 Rotary year. The meeting was an evening fellowship event held at the home of Kim and Gord Wallace and catered by Kings Court Catering. Each year for over twenty years the Rotary Club of Bowmanville has awarded bursaries to deserving students who have just graduated from high school and are furthering their education either at a post-secondary educational institution or in an apprenticeship program. Each bursary has a value of $2,000 with $1,000 awarded for the first year of studies and another $1,000 offered upon confirmation of continuing into a second year of study. This year, in order to streamline the selection process, the Student Guidance Office at our five local high schools were asked to each select one deserving student based upon several criteria. Those criteria included financial need, academic achievement, and community and extracurricular involvement. The students were also required to write an essay outlining their goals and plans for their future as they relate to the courses they have chosen. Peter Hoekstra, owner of Graphic Lettering Services and a great supporter of Rotary, was honoured with a Paul Harris Fellowship during our June 7, 2016 morning meeting. Peter was honoured for the support he provides to our community and to Rotary. Paul Harris Fellowships are presented to recognize individuals who have made unique and outstanding contributions to our community. Rotary's Ribs & Brews a GREAT success! Rotary's Annual Ribs & Brews a GREAT success!!! The Rotary Club of Bowmanville's annual Ribs & Brews event held on June 10th, 11th, and 12th was once again a great success. A line up of truly amazing talent, including both Dixie Chicks and Bon Jovi cover bands, an incredible selection of craft brewers, a terrific midway, the best ribbers this side of anywhere, and loads of family fun all combined to provide a wonderful time for those who attended. Your presence helped the Rotary Club of Bowmanville raise enough money to fund its charitable endeavours for the coming year. We would like to express our sincere thanks to all who attended and look forward to seeing you next year. For several years now the Rotary Club of Bowmanville has offered bursaries to support educational excellence in partnership with the Matawa First Nations. On June 2, 2016 four Bowmanville Rotarians (Ted Mann, Chris Christodoulou, Renee Bos, and Don Hutton) flew to Thunder Bay to attend the presentation of Matawa First Nations Bursaries. 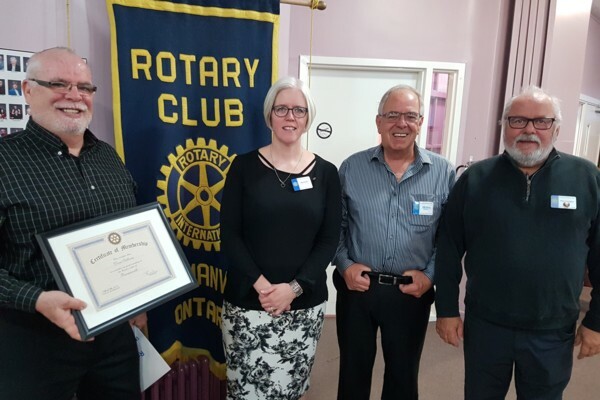 At a special May 17, 2016 evening meeting of the Rotary Club of Bowmanville, Paul Harris Fellowships were presented to four Clarington residents who exemplify the spirit of Rotary in their volunteer work in our community. The recipients were Sylvia and Ed van Haverbeck, Susan Sheen, and John Greenfield. In presenting the fellowships their Rotary sponsors outlined the exceptional qualities of these special individuals and their outstanding contributions to our community. The Rotary Club of Bowmanville presents Paul Harris Fellowships to recognize individuals who have made a unique and sustained contribution to our community. 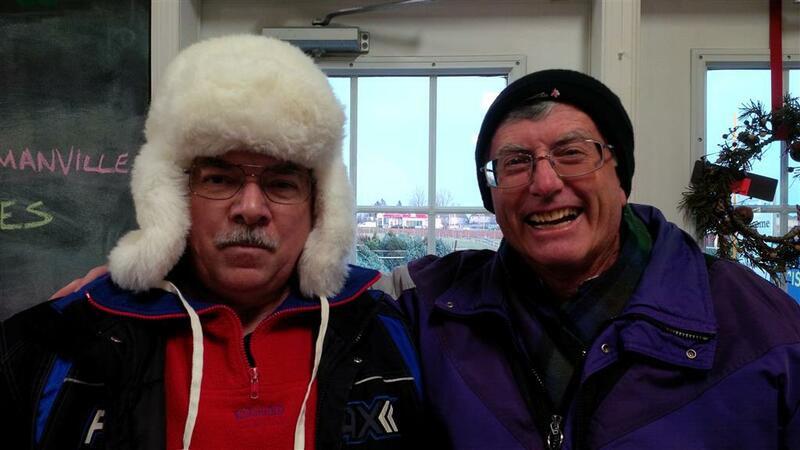 The nasty weather did not dampen the spirits of those who braved the snow storm to participate in the Purple Pancake Breakfast in support of Epilepsy Durham Region. Despite the snow, over $500 was raised to support the charity. Thank you to everyone who braved the elements to attend and to Wilmot Orchards for providing the blueberries. 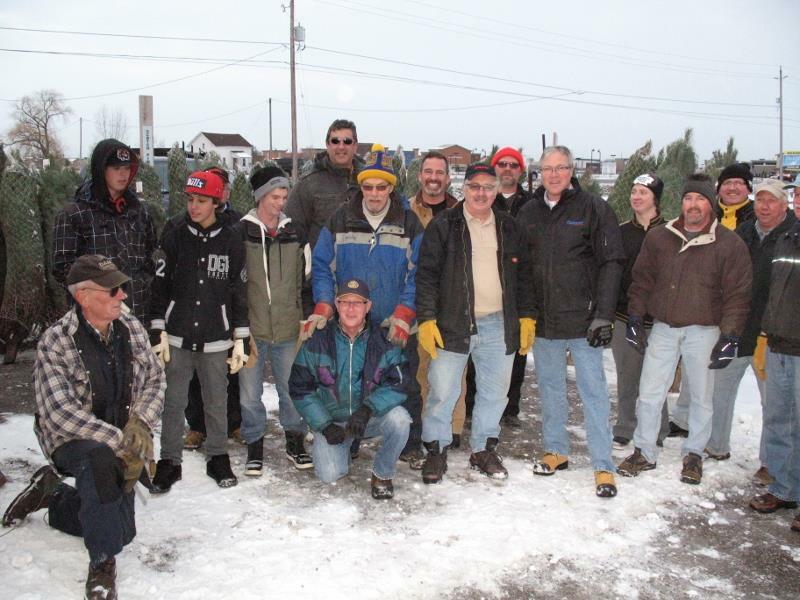 Rotary Christmas Tree Sale a Great Success! The Rotary Club of Bowmanville's Annual Christmas Tree Sale at Watson's Farm Market was once again a wonderful success. 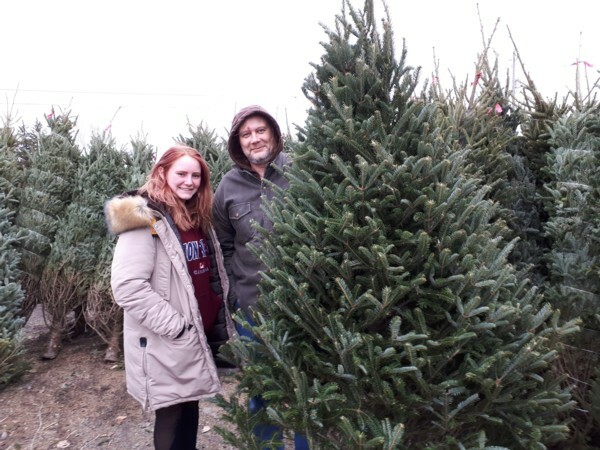 We would like to offer our sincere thanks to the Watson family for their support and a special thank you to everyone who purchased a tree from us. Your generosity allows us to do the charitable work we do. And to everyone who may happen upon this page, have a wonderful Christmas and all the very best to you and yours during the New Year. At its September 29th, 2015 meeting the Rotary Club of Bowmanville presented the 3rd Bowmanville Scout Troop with a cheque for $1000 to support their purchase of a new trailer to store and transport their equipment. The trailer will be shared with the other local scouting troops. The 24th Annual District 7070 Rotary Foundation Walk was a success again this year. During the past 23 years the Rotary Foundation Walk has raised just under $3 million for the Rotary Foundation. This year about 200 Rotarians, friends, and family walked in perfect late summer weather through scenic Morningside Park, Centennial College, and the new PAN-AM Facility in Scarborough to raise an additional ~$135,000 for the Foundation. President Steve Code, who got lost coming into the event, and Past President Lyle Goodin represented the Bowmanville Rotary Club this year. Breakfast and lunch were prepared by the Culinary School at Centennial College. ​The 2nd Annual Hope Cup Charity Golf Tournament wil be held on Saturday October 17, 2015 at the Black Diamond Golf Club in Pontypool. Please visit the "Upcoming Events" section for more complete information or contact Darryl Mathers (hopecupgolf@hotmail.com) for individual or team registration forms or to provide sponsorship. On behalf of Rotary Bowmanville and the more than 100 tireless volunteers that pitched in to help, thank you for supporting Ribfest. And thank you for your comments and suggestions. As your friends and neighbours, we share in wanting the best Ribfest experience for our community. On Saturday, May 23rd a group of 35 Bowmanville Rotarians and friends set off in the early morning for a wine tour of Prince Edward County on a bright and blustery morning. This outing was organized by our own Georg Krohn and we spent the day being driven around in a luxury coach stopping in at four very different wineries, being warmly greeted by the owners and sampling their latest vintages. It was a great day of fellowship and meeting new friends and sampling some wine. Thanks to Georg and his wife Elfi for organizing a great day for us. 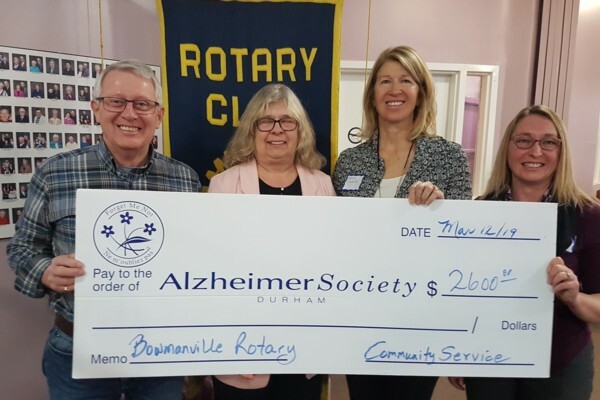 The Rotary Club of Bowmanville, the Bowmanville Lions Club, and the Clarington Older Adult Association partnered with Epilepsy Durham Region (EDR) to raise money for EDR by hosting a pancake breakfast on Shrove Tuesday February 17th. Over 200 persons attended the "pay by donation" event that featured an all-you-can-eat pancake and sausage breakfast. No pancake breakfast would be complete without a pancake eating competition and Rotary's Tim Funchion was the clear winner downing five pancakes in 38 seconds. The event was a wonderful success raising over $1500 for EDR. Rotary would like to express its sincere thanks to everyone who helped support this event. For more photos of the event, please click "Read more"
The Rotary Club of Bowmanville's annual Christmas Tree Fundraiser held at Paul Watson's Farm Market between November 28th and December 17th was once again a tremendous success. We sold out prior to the anticipated end of sales and although the final tally is not yet in, we anticipate that we did very well. We would like to take this opportunity to thank everyone who came by to purchase a tree and to support us in spite of the difficulties created by the construction. All proceeds from this fundraiser go toward our local and international Rotary projects, community groups, organizations, student bursaries, and our Summer Respite Program for Children with Special Needs. Thank you once again, Bowmanville for your generous support. All proceeds from this fundraiser go to local and international projects, community groups, organizations and our Summer Respite Program for Special Needs Children. During our Annual Christmas Dinner on Friday December 5, 2014, the Rotary Club of Bowmanville honoured two of its own by presenting Paul Harris Fellowships to Fred Mandryk and Georg Krohn. The citations for the two honourees outlined their dedication to their communities and to Rotary. Both Fred and Georg are exemplary models of "Service Above Self". Congratulations to you both. Well deserved! The International Service Committee has been very active recently and has approved funding for several worthwhile projects. The Committee contributed $100 per club member to the Rotary Foundation for Polio eradication. Rotarian Steve Rutledge received $8500 to complete funding for his water project in Katang Xieng, Laos. The Committee also donated $1000 to Allison Edwards and International Teams Canada for her Jinja Connection project to help purchase tooth brushes, toothpaste and back packs for street boys in her school in Uganda. ShelterBox Canada was given $7200 to purchase six Shelter Boxes used for temporary shelter during disaster relief. Medecins Sans Frontiers, better known as Doctors Without Borders, received $1500 to assist with their continuing international efforts. The Committee also committed $2000 toward the President's project for the purchase of school desks in Katang Xieng, Laos. A desk is donated in the name of each of our guest speakers as a thank you for their time. With the end in sight of Rotary’s campaign to end polio, the popular question is, ‘What’s next’? Steve Rutledge, founder of Adopt A Village in Laos and a fellow Rotarian from the Whitby Sunrise Club, hopes that the next campaign is Clean Water. “There is so much sickness and death in the world caused by contaminated water, yet it is completely preventable,” he explains. Case-in-point, Laos is the most heavily bombed country per capita in the world and it is still recovering. With the exception of a few cities, much of the country does not have access to a year round supply of clean water. This is where Mr. Rutledge becomes involved. “Currently, infant mortality is still around 8% and we are attacking this statistic head-on.” To date their organization, whose main focus is clean water, schools and toilets, has completed five water projects, built a number of schools, constructed toilets with running water for every school (plus 10 banks for a large village), and has installed 1377 water filters systems providing over 10,000 rural families, schools and medical clinics/hospitals with clean water. The Rotary Club of Bowmanville was involved in “Walk for the Best” with children and families of the Charles H. Best Diabetes Centre on Sunday September 21, 2014. This fun-filled day starring the children of the Centre was held at the beautiful Heydenshore Pavilion. 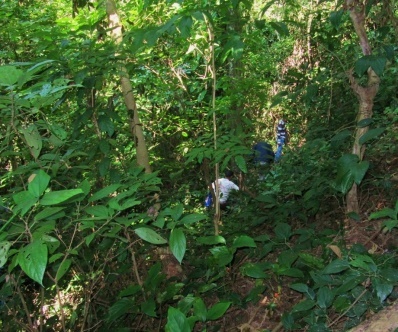 The day included a walk on the trails, lots of activities for the children, lunch and information provided by sponsors. The Charles H. Best Diabetes Centre for children and Youth was founded in 1989 as a “first of its kind” Centre in Canada. It is dedicated to providing young people and their families with education and support to meet their ongoing type 1 diabetes needs throughout Durham Region. The Centre is a registered charity with the majority of their revenue raised through various funding activities. They also receive financial support through Durham businesses, Service clubs and Corporate partners. Their motto "Keeping kids healthy until a cure is found!" Allison Edwards is a 30 year old local girl born in Ajax and raised in Courtice. For the past four years she has run a school for street children (boys) in Jinja, Uganda. She originally volunteered with the local Big Brothers and Sisters organization and following this joined Give International. It was during the three months she spent with Give International in Uganda that Allison saw the need for a school for local boys who were living on the street. At present she has some 30+ boys as pupils. Allison raises money locally and recently returned to her school with supplies donated to her by local organizations plus items such as toothbrushes, toothpaste and backpacks which she purchased from funds raised locally. In March there are plans to hold an 'African Tea' at the Courtice Community Centre to raise more money for her very worthwhile cause. The Jinja Connection's aim is to educate and empower the street children in Uganda to learn without discrimination. The Bowmanville Rotary Club has supported Allison and her worthwhile cause for a number of years and will continue to do so. At the heart of Team Hartwell is Carrie. Carrie Hartwell is a daughter, a sister, a friend, a wife and most importantly, a Mother. Anyone who knows Carrie is used to her kind words and smile, and may not have even realized that for the last two years she has been suffering from the terrible effects of the growth of a Pineal Tumor. A Pineal Tumor locates near the centre of the brain and the symptoms are headaches, nausea, vomiting, double vision and memory problems to name a few; combined they have made life intolerable for Carrie. There is light at the end of the tunnel, a new hope on the horizon, an opportunity to make the grey skies shine bright once again for Team Hartwell. On Sunday September 21st Rotary District 7070 held its annual Rotary Foundation Walk along the Toronto lakeshore. The event was a great success raising over $110,000 for the Rotary Foundation. Several members of the Rotary Club of Bowmanville participated in the walk and together our club was delighted to be able to contribute $7240 to the Rotary Foundation. Bono, lead singer and front man for the rock band U2, is well known for his humanitarian work. In this brief video Bono pays tribute to Rotarians and their belief in their motto of "Service Above Self". On June 1, 2014 new Rotarian Dr. Mark Bishara and his associates at the West Bowmanville Dental Centre hosted a free dental clinic. They were able to see 42 patients at the office for a cleaning, filling, or an extraction. Present for the event were Dr. Steve Margolian, Mark's father-in-law, along with Dr. Sheri Margolian, who is Mark's wife. They both also work in Whitby and Steve has been serving Durham and Whitby for over 25 years. There was no obligation for those attending the clinic to be a current patient. The three dentists simply wanted an opportunity to give back to the community. Patients came from as far as North York as well as from the local area. 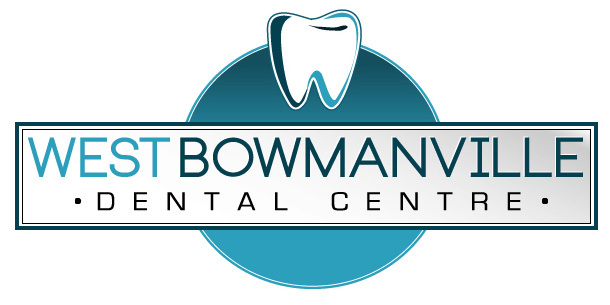 The three community minded dentists plan to host this event twice a year as an opportunity to give back to the community and the Rotary Club of Bowmanville is pleased to count Mark among its new members. 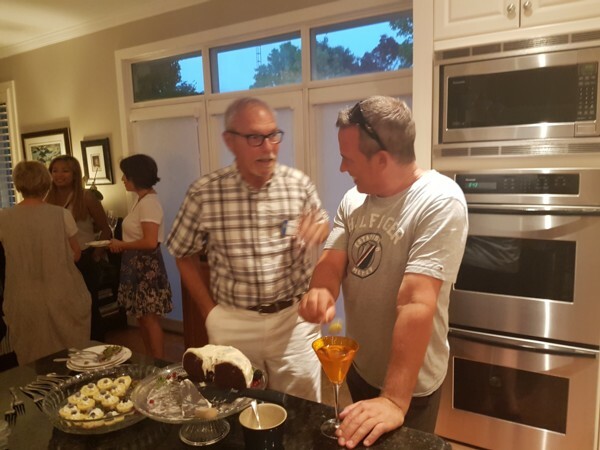 The June 24, 2014 meeting of the Rotary Club of Bowmanville marked the end of one Rotary year and the beginning of a new one. With the change comes a new President, a new Board of Directors, and a new Rotary theme - Light Up Rotary. Out-going President Don Hutton marked a very successful term in office during which he built, with the assistance of a very capable Board of Directors, a renewed and more vibrant Club. Don accomplished the goals he set for himself and the Club. He thanked District Governor Valerie Wafer, who was in attendance, and his Board of Directors for their support during the past year. Don presented in-coming President Gord Wallace with the President's pin. As a token of his appreciation, Don then presented each of his Directors with an uncirculated 2014 Olympic one dollar coin. In-coming President Gord Wallace thanked Don for his leadership during the past year and presented him with a recycled Past President pin from 1998/1999 when Don was President of the Club for the first time. Gord then presented Don with a blue bag that contained a 12 year vintage beverage. As Gord took over the remainder of the meeting, he committed to continue to build the Club and to bring a more business-like model to the functioning of the Club. The members gave an enthusiastic ovation to the two Presidents. We are all looking forward to yet another great Rotary year. 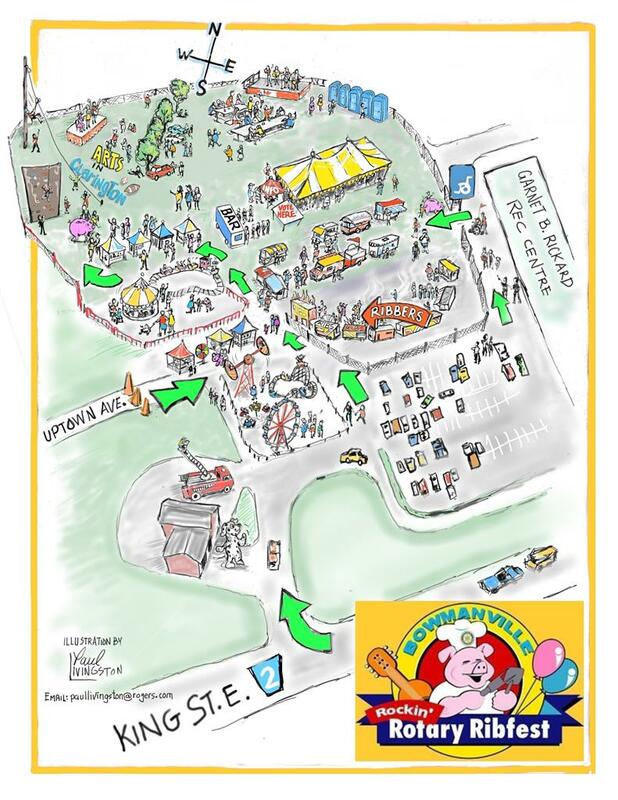 The Rotary Club of Bowmanville's 7th Annual Rockin' Rotary Ribfest during the weekend of June 6th, 7th and 8th at the Garnet B. Rickard Complex was an amazing success! We'll get more details as soon as they are available but in the mean time we would like to extend our heart-felt thanks to everyone who came out to have a wonderful time and to help us serve our community. In 1988-89 Donald Welsh was the President of the Rotary Club of Bowmanville. In that year he made the decision to work with a very active group of community members to advocate for a Seniors Activity Centre. 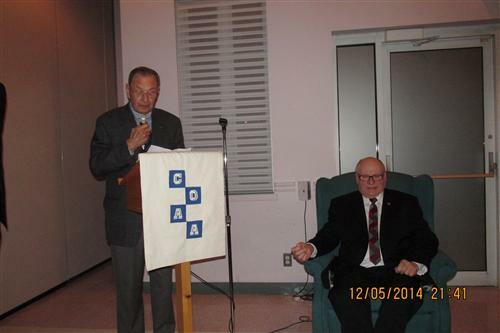 In September of 1998 the Clarington Older Adult Association was born under the fantastic leadership of many older adults. 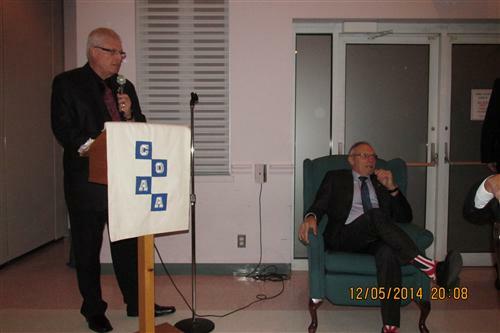 Donald Welsh has continued to be a BIG part of the COAA and its success over the years. 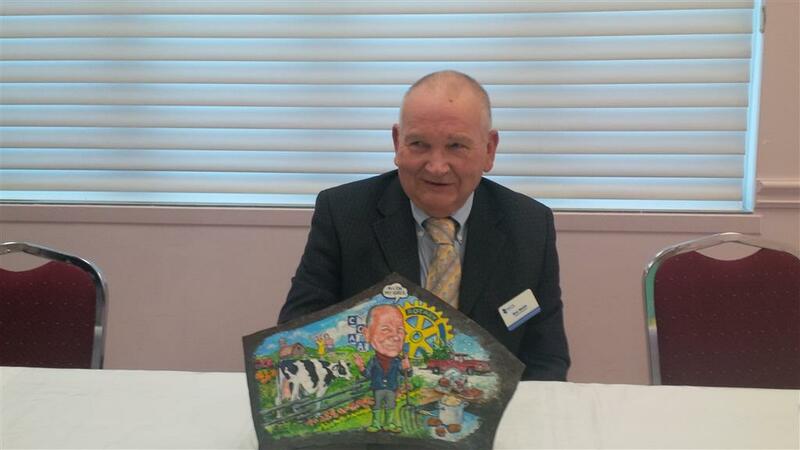 On Friday March 28th Past President Donald Welsh was presented with this custom made rock by local artist Paul Livingston to celebrate his many years of service. To the Rotary Club of the Bowmanville thank you for assisting us with getting our organization welcomed into Clarington. 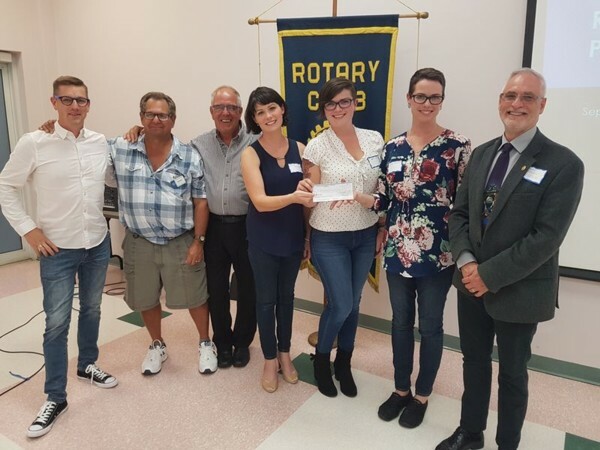 For many years the Rotary Club of Bowmanville has provided a Summer Respite Program for families within our Municipality with Children with Special Needs. We are super excited to be able to offer this program again for the Summer of 2014 and hope that you will pass the word on that we do have spots available for new families. The program involves one of our student respite employees spending 4 to 8 hours per week with your child and providing educational and recreational activities. Please if you are interested visit the link to our application on our website or contact us with your questions. For those of you who so generously donated to the Shoebox effort around Christmas last year you might be interested in where your gift ended up. · A total of 664,064 boxes were collected in Canada. · Total collected in Ontario 257,332. · In the Durham region 10,000+ boxes were collected. the Ivory Coast and Senegal. · There was a special airlift of 65,000 boxes to a refugee camp in Northern Iraq. I’m sure there are some very happy children enjoying the contents of these Shoeboxes so thank you again from the International Committee. About 80 volunteers came out. We ran 6 production lines for at least half the time, then 5 lines, then 3 lines toward the end. We started the video presentation about 8:45am, started packaging about 9:05am, and took a 15 minute break half way through, then completed packaging about 12:30pm – about 3 hrs & 5 minutes of actual packaging time. We originally planned to do Four Skids (132 boxes), but did an extra 5 more extra boxes for a total of 29,592 meals (137 boxes). 110 boxes, 23,760 meals were taken by Speroway to go to Haiti.
. 4 boxes, 864 meals were given to Carl Nabein of KAHC to take to Haiti. A Charming Evening was had by all and money raised for a good cause at the 'Pay-What-You-Can-Dinner" in Courtice last Friday night. 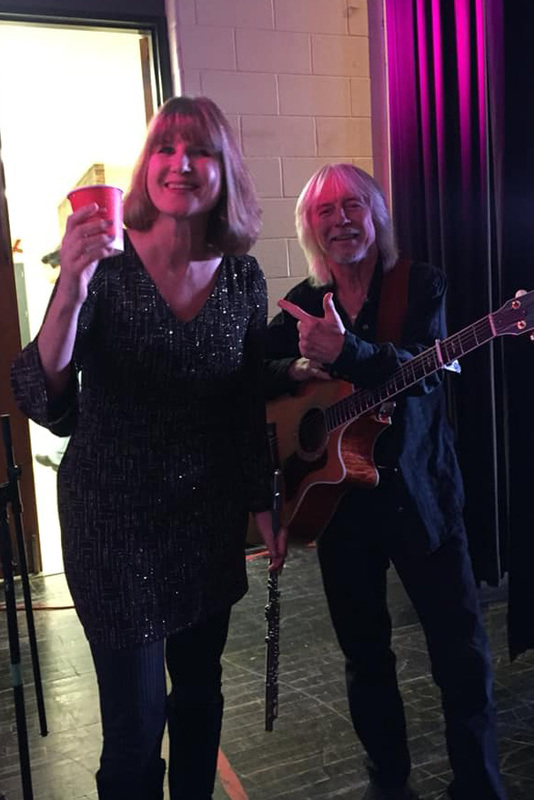 Co-hosts Lynda Mayes and Michele Cryan were pleased to serve 12 fellow Rotarians from the Bowmanville Rotary Club for a night of food, fellowship and music - special thanks to Terry Maxwell who played the guitar and took requests! Now That's How You Set a Table! Adopt-a-Village-in-Laos is pleased to present a photo of a Lao family member receiving a water filter system in our ongoing distribution (and hygiene training) in the northern region of Luang Prabang province in Laos. In this round we distributed 275 systems, with a total of 525 for the year. THANK YOU for your generous contribution! The water filter photos you will be receiving are as a result of the District Matching Grant. While the subsequent award was much lower this year due to the number of applications, we were still able to purchase 13 water filter systems and will begin the main water project in Phonesavanh in the coming weeks. We cannot express how grateful we were for all your help. Everything went as smooth as it could possibly go (you’d never know it was Ajax Rotary’s first attempt!). Having said that, none of this would have been possible if it was not for you!!!! We wish to thank our neighboring Rotary Clubs of Pickering and Whitby, who came out to help – “many, many thanks!! !” – including our past District Governor Ted Koziel and his lovely wife. The other groups were the girls’ soccer team “thank you coach Bill, girls and moms!” And the boys’ basketball team who helped us set up from 8 – 10am, “Thank you Fred and boys”. We also had members of Durham Trillium Quilters’ Guild, workers and their families from Ajax Library and of course our own Ajax Rotary Club. I am sorry if I missed any groups, but we had over 100 volunteers!!!!!!! THANK YOU AGAIN! This past May myself and three other Rotarians from the Bowmanville Rotary Club flew to Thunder Bay to attend the Matawa Rotary Awards Banquet. 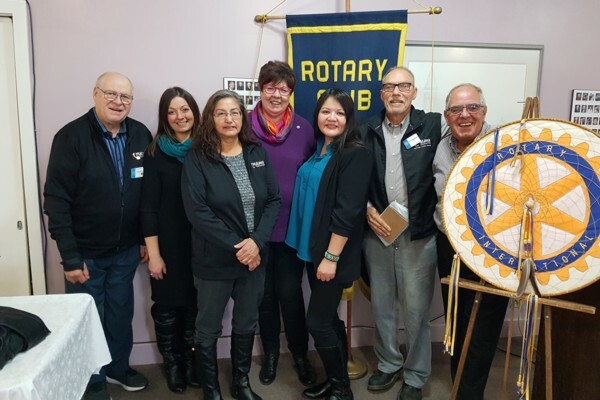 This is the sixth year in which the Bowmanville Rotary Club has participated in a literacy partnership with Matawa First Nations with a yearly funding of $10,000. District Governor Valarie Wafer supports a challenge to Rotarians in District 7070 to increase the number of registered consents for Organ and Tissue Donation in the Province of Ontario and in particular in our District. one donor has the potential to save eight lives through organ donation and enhance the lives of seventy five others through the donation of tissue. currently in Ontario there are more than fifteen hundred people on the waiting list for a life-saving organ transplant. research shows that many Ontarians think that they are registered but are not. The result is less than 25% are registered organ and tissue donors. Our goal is to inspire members to check their status, and either confirm registration or register for the first time. We hope that they will encourage family and friends to join in the clubs’ initiative. All you need is your health card and two minutes of your time. This is the ultimate opportunity for “Service Above Self” with no financial impact on the donor or their family! For more complete information visit our site page or go to our campaign page to register. 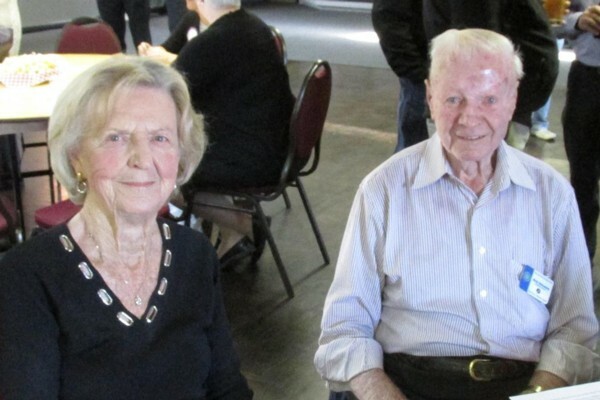 Hilda Finnigan, Past President of the Rotary Club of Oshawa Parkwood and a volunteer with the Trillium Gift of Life Network will facilitate clubs in participating in this project. With the assistance of TGLN staff she will report the results of our efforts every three months. 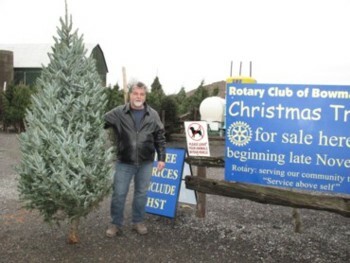 Rotary Christnmas Trees are available at Paul Watson Farm Market located at 2287 Highway 2 in Bowmanville. We are open from noon until 8:00 PM Monday to Friday and 10:00 AM until 6:00 PM Saturday and Sunday. Monday December 23rd is our last day so don't delay; time is running out. A great day was had by all of the Rotary Families who attended our Annual Family Christmas Party held at the Clarington Beech Center on Sunday December . From start to finish the party provided fun for all. Please if you are interested in viewing all of the photos from this event feel free to click on the photo album link to the right of the main website page. Many thanks to all of the Rotary members who assisted long with our Clarington Interact Members, Courtice Rotary Members, Janet Lange, Paul Livingston and Magic Al, KCC Gourmet Catering. Rotary Christmas Trees have arrived! Tuesday November 28th saw the arrival of six hundred Christmas Trees to Watson's Farm Market located at 2287 Highway 2 in Bowmanville. The trees will be sold by the Rotary Club of Bowmanville as a fundraising event. We have a variety of trees ranging in price from $40.00 to $60.00. Our hours are Monday to Friday 12:00 pm to 8:00 pm and Saturday and Sunday 10:00 am to 6:00 pm from November 29th to December 23rd. So, why not drop by for your Christmas Tree and some farm fresh produce. Your purchase will help Rotary's work in your community. The rain held off to make the annual Rotary Foundation Walk a great success again this year. 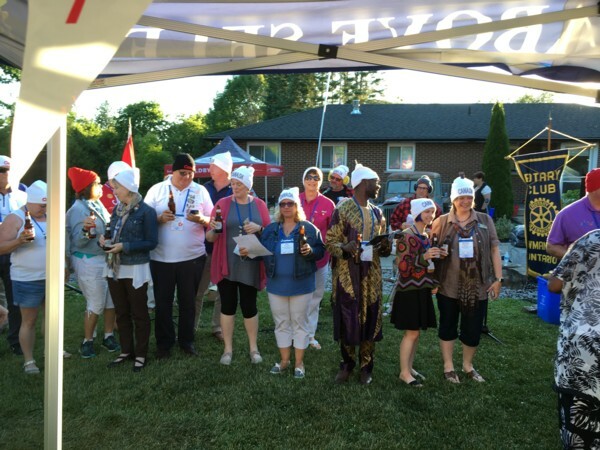 Hosted by the Clubs in Area 5 of Rotary District 7070, the event took place in historic Newmarket, Ontario. Representing the Bowmanville Rotary Club were (seated L to R) Lyle Goodin, Steve Code, Wayne Routly, Fred Mandryk, Elaine Hutton, and Club President Don Hutton. The walk began at the Newmarket Community Centre on Doug Duncan Drive and followed the Nokiidaa Trail north to Queen Street and thence in a loop that included a number of interesting historic landmarks such as Cane House (home of Newmarket's first mayor, William Cane), the Newmarket Train Station (built in 1899 for the Grand Trunk R.R. ), the Union Hotel, Christian Baptist Church (1874 - where Alexander Muir's "The Maple Leaf Forever" was first performed), the Registry Office (1884), the Post Office / Federal Building (1914-15), Newmarket Town Hall (1883) and the North American Hotel on the corner of Botsford and Main Streets where William Lyon Mackenzie began his campaign for change with a speech from a balcony. For those who only wished to do a short walk, this loop back to the Community Centre provided an opportunity to relax and visit with friends. On Tuesday October 1st. the Bowmanville Rotary Club was pleased to host numerous guests at their regular Tuesday morning meeting, but were more than excited when Oshawa Rotarian Gerry Johnston attended with his family. They were invited guests that morning to receive a cheque in support of the fundraising efforts that Gerry and his family have launched for the ALS Foundation (ALS can also be referred to as Lou Gehrig's Disease). The Rotary Club of Bowmanville was awarded a 2012-2013 Presidential Citation for actively working to achieve Peace Through Service. The requirements for the citation were set fourth by Rotary International President Sakuji Tanaka. The award was received on behalf of the club by out-going president Lyle Goodin. 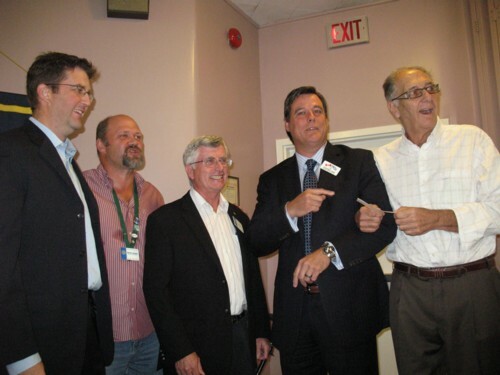 July 9th 2013 marked the changing of the guard for The Rotary Club of Bowmanville. A big thank you to Lyle Goodin for working so hard the past rotary year and welcome back Don Hutton. For the first time is 89 years the Rotary Club of Bowmanville has a president returning to represent. 15 Years ago Don Hutton was at the podium collecting his Presidents Pin and again this year he has done the same. Welcome to the Rotary Club of Bowmanville. Celebrating 91 years of community service in Bowmanville/Clarington. Please take a few minutes to learn what Rotary is doing in YOUR community and in other countries around the world. Our motto is "SERVICE ABOVE SELF". You can support Rotary by becoming a member or by providing a donation. If you are seeking an opportunity to make a positive contribution to your community, why not visit us during one of our regular morning meetings to find out more about Rotary. Donations to Rotary can be made by cheque or VISA.